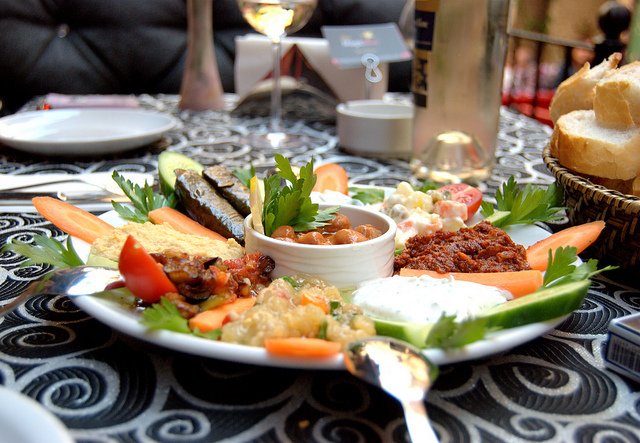 Turkish cuisine is fast making a name for itself on the worldwide culinary platform. The combination of flavours and ingredients are blended together to form dishes historically influenced by a number of cultures including the Greeks, Ottomans, middle eastern and Balkans. Traditional dishes will vary from region to region so on this list, we bring you the most popular Turkish food dishes from across the country. Kumpir is another form of street food that is popular in the beach side resorts and cities. It is simply a jacket potato with a crisp outer skin and soft inside, mashed up with butter. Choose a variety of fillings to top it off, including cheese, sausage, pickles, and Russian salad. If you are in Istanbul, the most popular area to eat it is Ortakoy. 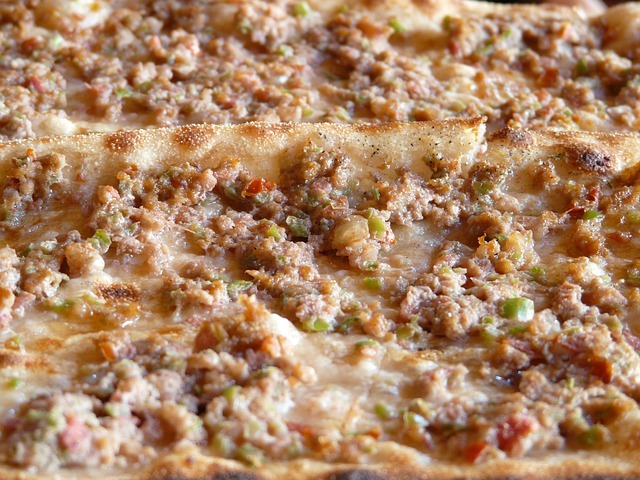 Pide is a popular dish in lokantas, that are Turkish restaurants serving cheap and traditional Turkish food. A thin crust of pastry is covered with toppings including cheese, egg, diced meat, chicken or tuna and then it is put it into a high heat stone oven. The nearest equivalent western food is pizza. Another version which is lighter is lahmacun. Both are traditionally served with salad. This is an ideal option for vegetarians as many fillings are available. Kofte is the Turkish version of meatballs. Sold in a wrap as street food or served on a plate with rice and salad in restaurants. There are many different types of kofte and their taste will vary depending on the region that recipe originates from. 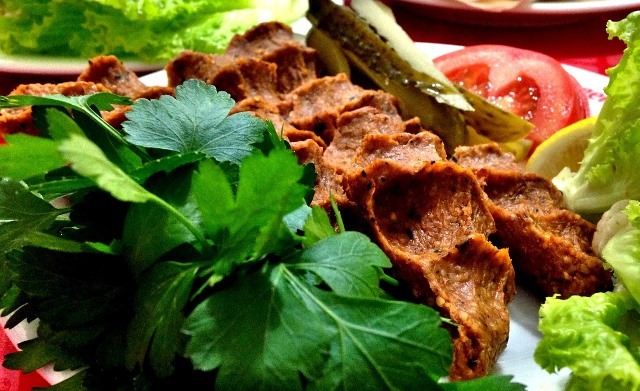 Çiğ kofte is unusual as it is raw meatballs originating from the south east of Turkey and these are traditionally eaten as a snack or appetizer. 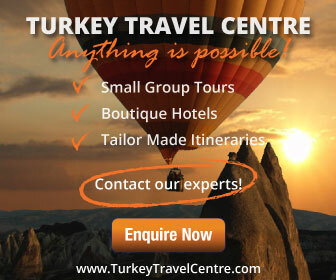 Possibly the most popular Turkish food is baklava which will suit anyone with a sweet tooth. Taking it influence from the Ottoman Empire, it is layers of filo pastries, filled with nuts and then covered with a sweet honey or syrup. 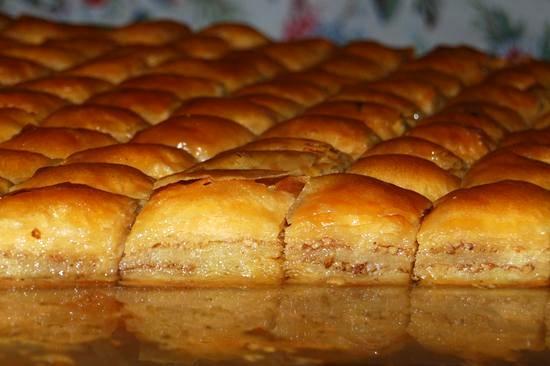 Purchase baklava from most supermarkets or pastry stores. More about baklava here. There are more than 40 different types of kebabs in Turkey but the most popular is the traditional street kebab. Large skewers of rotating chicken or beef are cooked slowly before the cook slices stripes from the outside of the skewer, places them in a pastry wrap, and then fills it with lettuce, onions, and tomatoes. A street kebab is especially delicious with a glass of Ayran. (Yogurt, salt and water.) Read more about Kebabs here. Mezes are appetizers, traditionally eaten before a meal or on their own as a snack. Popular mezes include acılı ezme, a hot paste made from peppers, patlıcan salatası (cold aubergine salad) and cacik (yogurt, cucumber and garlic). 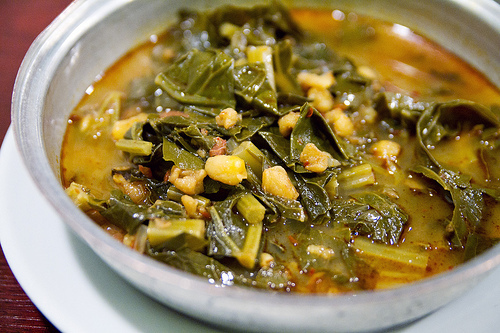 Mezes are also the traditional food served in the Meyhanes of Istanbul. More about this cultural tradition. Cheap, tasty and very filling, Gozleme is a popular street food sold at local markets. Traditionally considered the working man’s food, it is layered pastry filled with a variety of fillings including spinach, cheese, potatoes and parsley. Cooked on a large grill and normally accompanied with tea or Ayran, it is a perfect choice for lunch and ideal for people travelling on a budget. Menemen is not often seen on restaurant menus but most kitchens will make it for you, as it is quick and easy. Peppers, onions and tomatoes are fried in a pan and then eggs are scrambled into the mixture. It is served with fresh bread and delicious with homegrown olives. Find out more about our private Istanbul Gourmet tour : Cihangir, home of great modern restaurants and stunning, renovated loft apartments is the current neighborhood of famous author Elif Safak who set some of her wonderful, boozy cafe scenes in this area. . 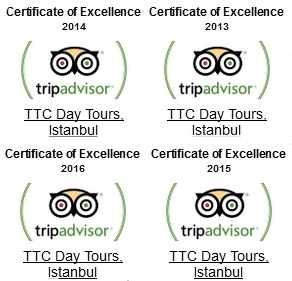 Experience this exciting part of Istanbul through your taste-buds. Walk in the locals’ footsteps, and try local flavours. This is no kebab crawl! Find out more.